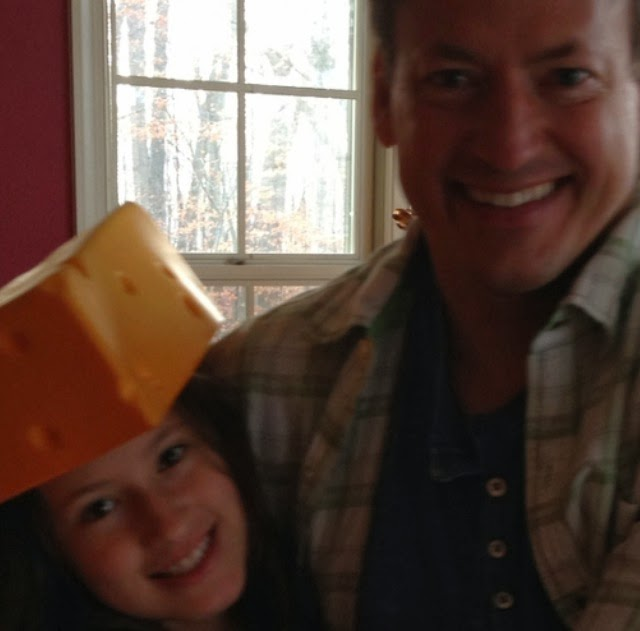 How smart really is Goldman? Felix Salmon has the answer!! With Jon Corzine losing the governorship of New Jersey yesterday, it was yet another bad day for former heads of Goldman Sachs. It’s worth running down the list, since the venerable pairing of John Weinberg and John Whitehead came to an end in 1990. 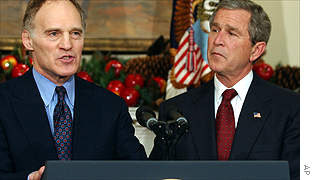 First up there was the pairing of Robert Rubin and Stephen Friedman. Both of them attempted to become venerable eminences grises, but neither succeeded, in the end. Friedman became chairman of the New York Fed, where he helped to which put together the deal under which AIG’s CDS counterparties, foremost among them Goldman Sachs, got paid out at 100 cents on the dollar, He was also involved in approving and which also approved Goldman’s request to become a bank holding company. He then inexplicably bought tens of thousands of shares Goldman shares in the open market — a clear conflict of interest given his position at the Fed — resulting in his resignation shortly afterwards. Rubin, of course, looks even worse. As arguably the most Wall Street-friendly Treasury secretary ever, he helped to inflate the deregulatory financial-services bubble on the basis that big banks were extremely sophisticated and more than capable of looking after their own risk books. He then moved to the ultimate cushy job at Citigroup, where he got paid $10 million a year despite having no employees, no P&L, and no defined responsibilities. In hindsight, his main contribution to the bank was to be the biggest internal cheerleader for the fixed-income group, which he encouraged to take on ever-greater amounts of risk despite the fact that no one in senior management (including himself) really had a clue what they were doing. Result: disaster. 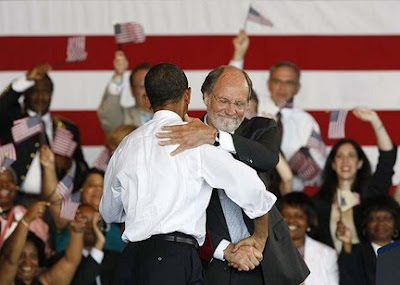 Rubin and Friedman were succeeded by Corzine, whose post-Goldman career has been spent almost entirely in politics. He was pretty ineffective in the Senate, before moving to the governorship of New Jersey. 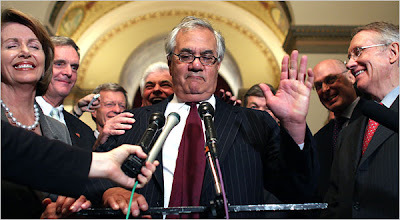 (In a classic case of the squid’s tentacles being everywhere, he there helped oversee the incoherent mess at Ground Zero, due to New Jersey’s 50% stake in the Port Authority of New York and New Jersey. The chairman of the Lower Manhattan Development Corporation, charged with rebuilding at the site, was former Goldman senior partner John Whitehead.) Never much of a natural politician, he basically bought both jobs, which at least meant that he wasn’t corrupt. But after he was almost killed in a 91 mile-an-hour car crash where he wasn’t wearing a seatbelt, he lost a large chunk of whatever leadership ability he had formerly held. 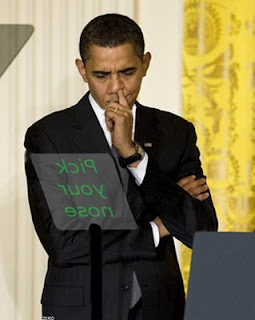 His political demise yesterday, at the hands of an oafish opponent, comes as little surprise. 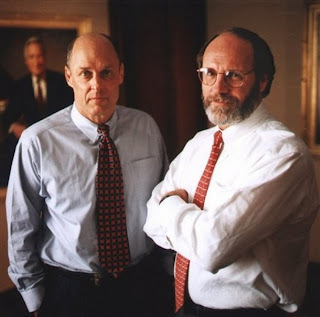 Corzine, in his turn, was replaced (indeed, ousted) by Hank Paulson. 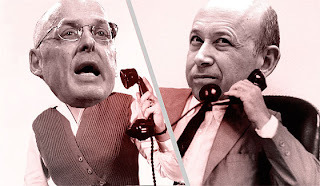 Paulson’s post-Goldman career, of course, was spent as the Treasury secretary who oversaw the biggest financial meltdown since the 1929 crash. Reading Andrew Ross Sorkin’s Too Big To Fail, which was clearly written with a lot of help from Paulson, he comes across as a man who was always at least one step behind the curve, someone who could never get ahead of the unfolding crisis, who was prone to inconsistent and ad hoc decisionmaking, and who went out of his way, even before getting a waiver allowing himself to talk to Goldman Sachs, to be as helpful to them as he possibly could. Paulson seems to have spent a large amount of the crisis throwing up in his office bathroom, and even into Nancy Pelosi’s wastebin. Of course, he couldn’t simply go see a doctor, like the rest of us, because he’s a Christian Scientist. Similarly, he hobbled his ability to communicate by refusing to ever touch email: instead, any time he wanted to say anything to anybody he’d have to do so over the phone or in person. No wonder he was semi-permanently hoarse, and his phone records are insane. 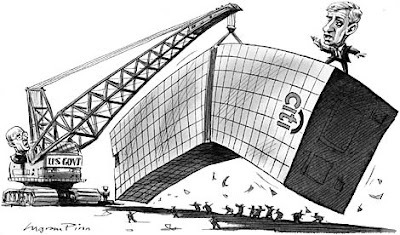 Paulson’s biggest failure, of course, was that of Lehman Brothers: he set up an emergency weekend confab at the New York Fed in an attempt to save it, but refused steadfastly to ever consider any public help at all, and also failed to keep British regulators in the loop, despite the fact that their assent would be needed in the event that Barclays were to acquire Lehman. In fact, when the fateful phone call to the Brits was made, it was the hapless Christopher Cox who made it, rather than Paulson. In general, Paulson was more of a bully than a leader, and he managed to be equally unpopular both on Capitol Hill and at the White House. Looking at the list, it seems to comprise men who are very long on hubris, and who have no doubt that if they can run Goldman Sachs, they can do anything else, with normal rules not really applying to them. All of them, post-Goldman, have been tarnished. If Lloyd Blankfein has any sense, he’ll retire quietly. 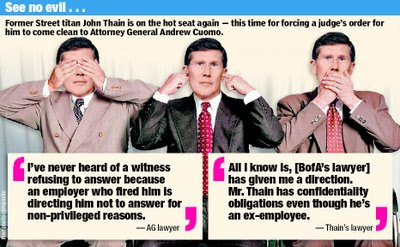 He didn't even mention John Thain! Tonight, Treasury said Goldman Sachs and Warren Buffett won't be permitted to buy $3 billion of Fannie Mae low-income housing tax credits. The public is sick of taxpayer handouts to thieves, and sick of those who ask us to pay higher taxes, while they bribe the Government to pay less. Corzine's blistering defeat shows that Goldman Sachs is now a liability in the court of public opinion. Take a look at all these inside deals. Where are the Feds on these? And, btw, isn't Goldman a bank holding company? Does anybody have a credit card from Goldman? Does anybody have a checking account at Goldman? And can anybody besides Goldman finance $200 billion of trading capital at less than 1%? With taxpayer help? So Goldman executives can rig markets and get $18 billion of bonuses? So why does Goldman, then need the taxpayer subsidy? And why do Goldman's executives fail in the real world, when they don't have our Government coddling them? And why do they lose elections, even when our President pimps for them? It might be, because Goldman also has a telepromter. And it's in their trading room, giving them their picks! Interesting post... Looks like flash memory is finally beginning to take off. Hopefully we'll start seeing decreasing solid-state drive prices soon. $5 32 GB SDs for your Nintendo DS flash card... sounds good to me!